Time for another NES classique. Man, Konami was AMAZING back in the day. They gave us Metal Gear, Contra, Gradius, Suikoden, Castlevania, and lots of other good stuff. Nowadays they're firing Hideo Kojima and just generally being the worst. This game is licensed by Nintend. Get the O out. 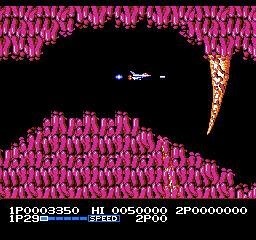 This is the sequel to Gradius...sort of. 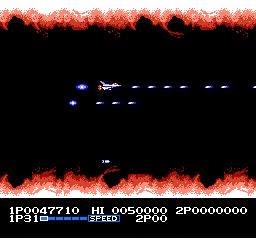 There was also a Gradius II, but it seems like this game is more popular and remembered. 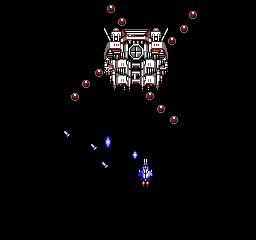 It's much harder than Gradius, which is saying something...but it's also very short. 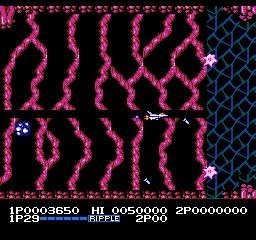 The game begins with you in some sort of cave where the walls grow outwards to crush you. It's as bad as it sounds. Later on we face some weird fang things that pop out of the walls. Well, so far the walls are the biggest threat. 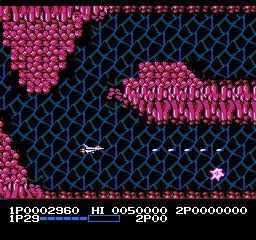 The graphics are notably better than the original Gradius, at least, and the same set of powerups return here. Worse are the walls that regenerate. You need to stay right on top of the walls you destroy because the ones behind you are going to regenerate right onto you in mere moments. 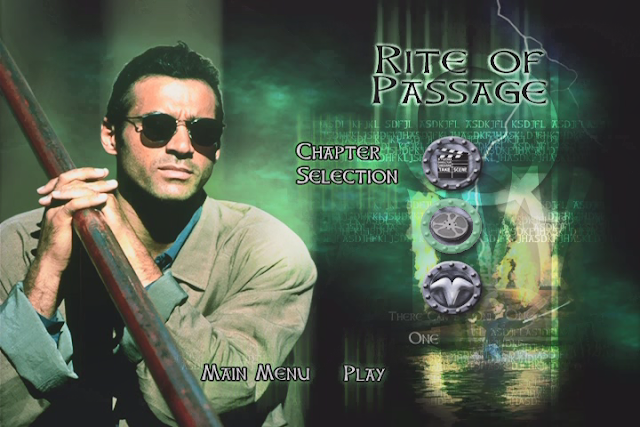 Luckily, this game has very little of this particular mechanic, but they used it a LOT in later titles. 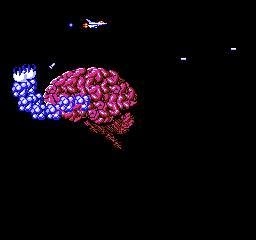 The first boss is a disembodied space-brain. The question is, who did it escape from? It sprouts groping grabby-hands and chases Vic Viper around the screen, reaching for our hero's tailpipe. 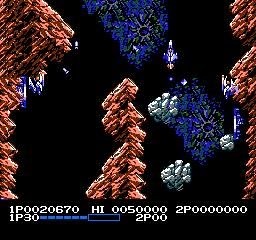 Stage two is vertical, Contra-style. I'm a fan of switching things up, and the vertical stages tend to be a little easier to follow. At least for me. Probably because I grew up with Space Megaforce. 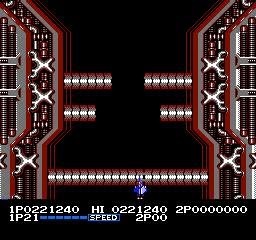 What I thought was the next boss: A mecha-wall. Again, very Contra. I blast away the various shields and panels until the whole thing blows up. Gotta say, this was the first time the game really tested me, as rough as the first two stages were. 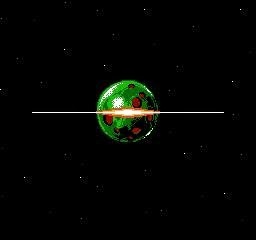 The three doorways fired bouncing balls that ricocheted all over the place, and keeping track of their movements required Jedi-like reflexes. 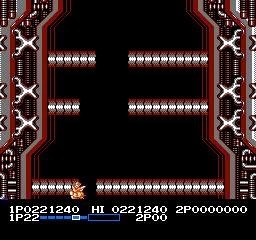 Defeat the mecha-wall and the stage isn't even over. That thing was a MINIBOSS? 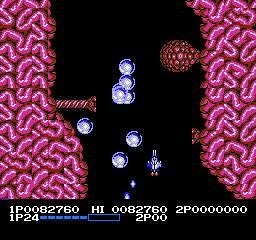 Regardless, the actual boss follows the same pattern as the first boss, chasing you around in a big circle. Options help for hammering the boss as you rotate around the front. As usual you can have two Options, but they don't extend out as much as they usually do in these games. Also noteworthy: Your special weapon upgrade can be either the Straight Laser or the Ripple. Both have their pros and cons. I like the way the straight laser moves with your craft (probably to save on memory usage). 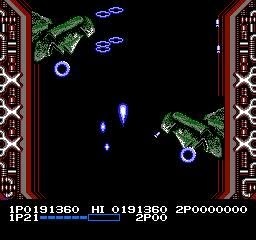 You can also get a second powerup of your choice laser (and missiles) to speed up the fire-rate of the weapons. 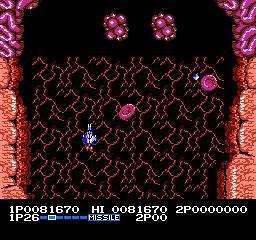 Missiles are especially crucial in this game because enemies love to hug the floors and ceilings. The hardest stage for me overall was probably stage three. 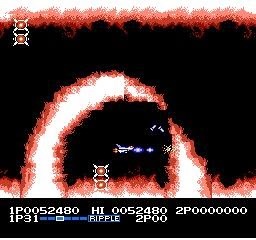 These corona-flare looking fire arcs give you little to no warning before ROARING ACROSS THE SCREEN, and it was very difficult to get through here in one piece. 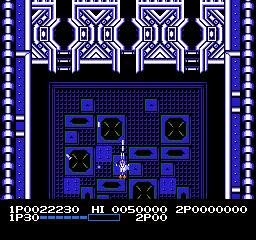 This is some very impressive stuff for the NES, graphically. 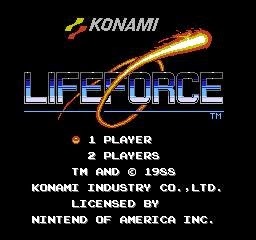 BTW, I used the Konami Code for this game. Much like Contra, it seems designed to be played with that code. The boss here is... a dragon? 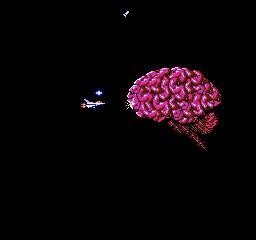 This is actually weirder than the brain. 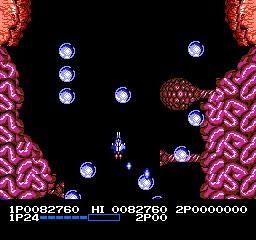 Did we step into Parodius? Regardless, it's a very easy fight. 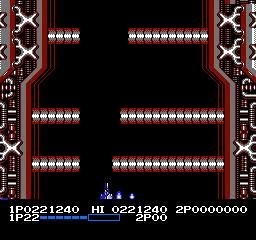 The bosses in this game tend to be much easier than their stages, for some reason. Often with shooters it's the other way around. Stage four goes back to the vertical scheme, as our hero enters some sort of organic intenstinal track level. 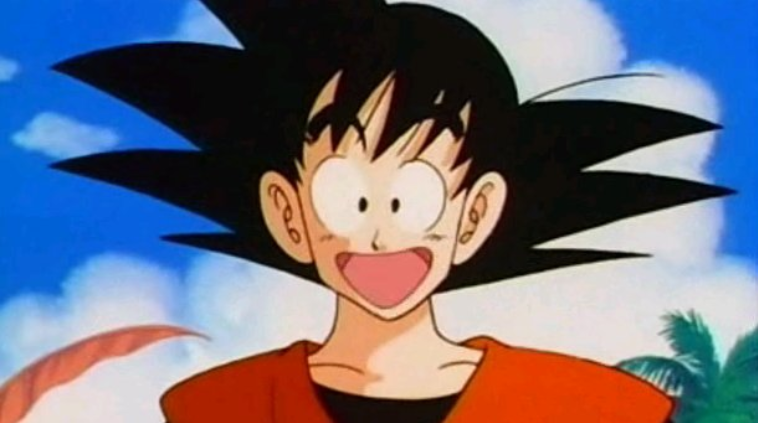 Alternating between horizontal and vertical levels is also something Axelay utilized. 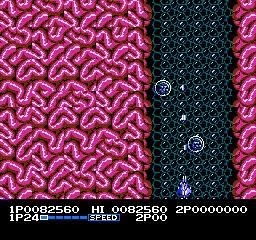 I gotta say, flying through intestines is a real step down from the awesome level before this. The intestines are full of all kinds of grossness, and I think I saw Rush Limbaugh's head in here. After that nightmare, the Terminator-head boss is no problem at all. It's pretty unpleasant to look at, though. The eyes pop out and chase you around. Why did this game suddenly get so weird? Let's just move on. 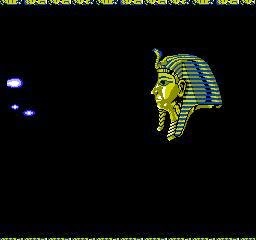 Proto-Parodius continues, as stage five is Egyptian-themed. I was using the Straight Laser for the most part, but I switched to the Ripple here to cover more ground even if it does less damage. Also, the Ripple isn't as straight, but this is 2015, people. Long story short, the boss is another easy fight. 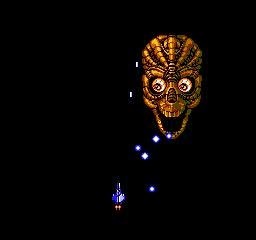 I'm a big fan of sarcophagus-masks showing up as bosses in games. Actraiser has a really good one. The reason my ship looks like a blue fireball, you ask? I got the final powerup, Barrier, which lets you sustain a couple of extra hits. I like it more than the Force Field of other games in the series, which only covers the front of your ship. Stage six is the finale, and FINALLY gives us what we've been clamoring for: Moai Mania. These iconic statues are always fun to see. Between this and the Egypt level, was this game going for a Chariots of the Gods theme? I.e. we're fighting aliens that visited Earth once? Maybe, on some level. The final boss is this...giant eye...thing. 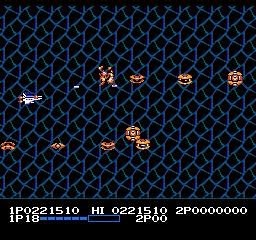 Well, the real fight is against the little serpent on the right, which chases you around the screen. Once it's defeated, it takes only seconds to pummel the eye and win the battle. Yet another underwhelming boss in a game full of easy fights (except for that wall miniboss early on...thing was brutal). 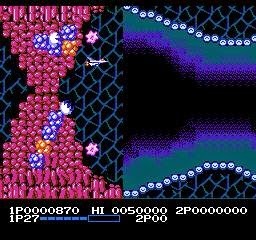 Even after you beat the final boss, you have to escape through this tunnel where walls zip in from the sides. 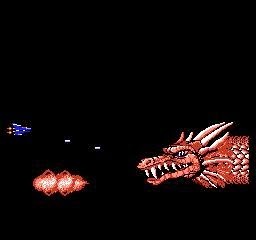 If you die and lose all your Speed powerups, it's GAME OVER, MAN. Dodging these things is hard enough even with Speed amped up. URRRGH! The autoscrolling is ridiculous here! 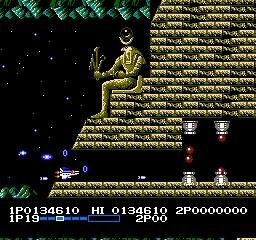 What is this, Battletoads turbo tunnel? OH COME ON! THAT ONE ISN'T EVEN DODGE-ABLE! After dying my way through that final sequence, the planet explodes. It's a pretty tame explosion. 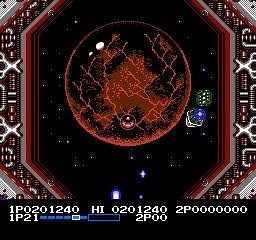 Makes the Super Metroid ending look like a hypernova in comparison. Then the game immediately puts me back at the beginning, but I think the enemies move quicker now. Ehhhh. No thanks, I'm about done with this one. It's a pretty cool game just because there's so much weirdness in it. Read this on the way to work on my phone. It's a new era! I hope I can use "Nintend" in a sentence someday. As in, "I play my video games with a controller just as God nintended!" I had a graphing calculator game that was all about staying in the tunnel as the walls closed in on you. It was extremely addictive. The contrast between the techness of your ship and the bodyness of your environment is interesting. That fire is awesome. Is it the technology or the art style that makes it look so advanced? It's great what a good artist can do for a game. Polyps. Polyps in a game. This makes me want to not get cancer. I agree, this was a good title. I like how you're cool with these hyper-linear shooting games as well as very unlinear RPGs. Enemies can pass through walls? The hell! Never been a fan of escape sequences after final bosses. Mega Man X3, Parasite Eve, and Starfox 64 did that too.